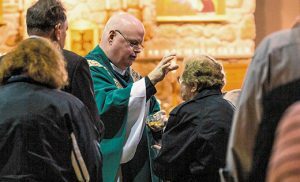 Father Robert Hughes, Vicar General of the Camden Diocese, administers the sacrament of the anointing of the sick during the Mass of hope, thanksgiving and remembrance for cancer patients, survivors and families who have lost a loved one to cancer. 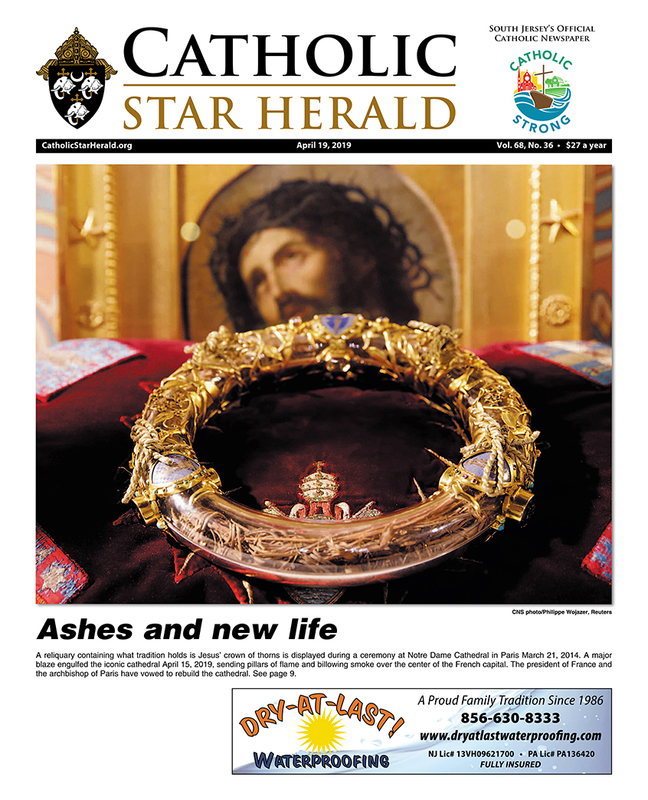 More than 200 people attended the Mass, celebrated Nov. 4 at Church of the Holy Family, Sewell. 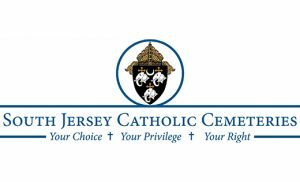 On Sunday Nov. 4, VITALity Catholic Healthcare Services of the Diocese of Camden sponsored a Mass of hope, thanksgiving and remembrance for those persons currently battling cancer, those who are cancer survivors, and for those who have lost a loved one to this dreaded disease. 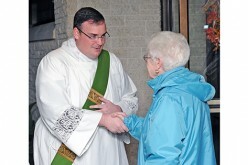 The Mass was celebrated at the Church of the Holy Family in Sewell. 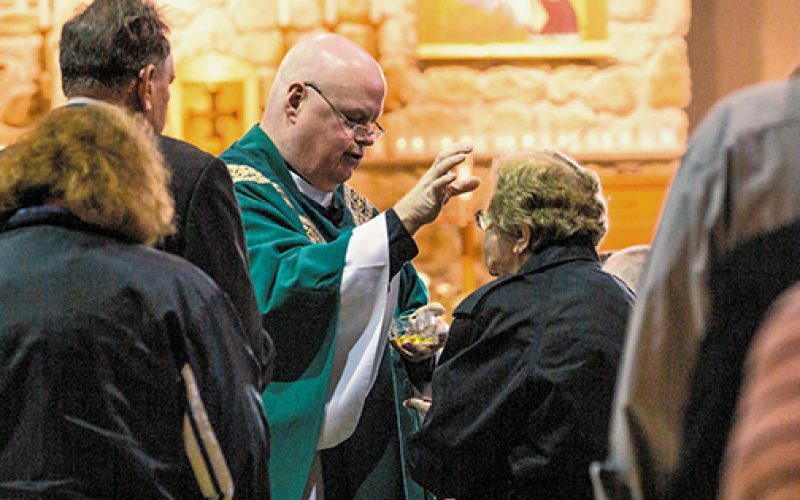 Father Robert Hughes, Vicar General of the diocese, was the main celebrant, along with several other priests who concelebrated and assisted in conferring the sacrament of the anointing of the sick to over 50 individuals who are currently battling cancer. The Mass attracted over 200 of the faithful from throughout the diocese. 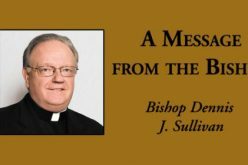 In his homily, Father Hughes reminded those currently battling cancer that their suffering and pain is their participation in the cross of Christ and is a great act of love for the world to witness. And that their faith in God and their hope in his healing power is a beautiful testimony to their love of God and love of neighbor. Emotions ran high with tears of joy and renewed hope evident as the priests scattered throughout the church and anointed those who requested the sacrament to give them strength for healing as they continue their treatment and care to beat this disease. 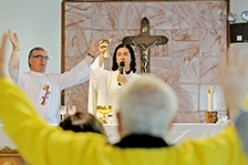 The Mass was followed with a time of refreshment and fellowship as the faithful gathered in the Parish Center to meet new friends and reinforce the bonds of friendship and love among those who have supported them throughout their struggles. Deacon Jerry Jablonowski is executive director, VITALity Catholic Healthcare Services, Camden Diocese.